“CVU EnACT is working with Transition Charlotte to coordinate a Repair Cafe here at CVU on Saturday, 5/18 from 10-2. A repair cafe is a community event where community volunteers offer no-cost repair of clothing, jewelry, electronics, small appliances, furniture and more! You bring the broken stuff and our volunteer fixers will use their skills to help you fix your stuff so we can keep it out of the landfill and learn from important skills from one another. At this point, we are continuing to recruit volunteer fixers — this is open to students, faculty, staff and CVU families. We especially need repairers who can help with: skateboards, lacrosse sticks, bikes, and small appliances like radios, cd/dvd players. We also especially need more fixers who know about computers, laptops and smartphones. Also, if you know how to mend clothing by hand or sewing machine, repair lamps–replace switches and cords, tighten wobbly lamps, sharpen garden tools, replace wooden handles, repair trimmers/weed-wackers, repair jewelry (no soldering), replace watch batteries, fix watch bands, repair furniture, sharpen knives or scissors, or tune chainsaws, we want you! If you can join us as a volunteer fixer for part or all of the event, please contact EnACT adviser Katie Antos Ketcham @ kantosketcham@cvsdvt.org or Jamey Gerlaugh with Transition Town Charlotte at Gerlaugh@gmail.com. Please start by joining us Thursday, May 2 at 6:30 pm @ the DAML. We will discuss “Drawdown” by Paul Hawken. No need to read ahead! Learn the most effective ways to reverse global warming. Books available for check out at the front desk if your interest is peaked. Beverages and dessert provided. Sponsored by Sustainable Williston and SunCommon. It’s a big weekend for sustainability in Williston. We still need volunteers for both events! Sustainable Williston (SW) provides zero-waste support to the Williston Fire Pancake Breakfast for the second year running. Volunteers are needed for 1 hour shifts beginning at 8, 9, 10, and 11am to help visitors separate compost from trash. Please contact Caylin McCamp at caylin.mccamp@gmail.com to sign-up for a shift. No prior experience required! Our Silverware Share will also be on show with SW volunteers washing throughout the event to limit use of single-use plastics. Thank you to the Williston Fire Department for partnering with SW again this year! 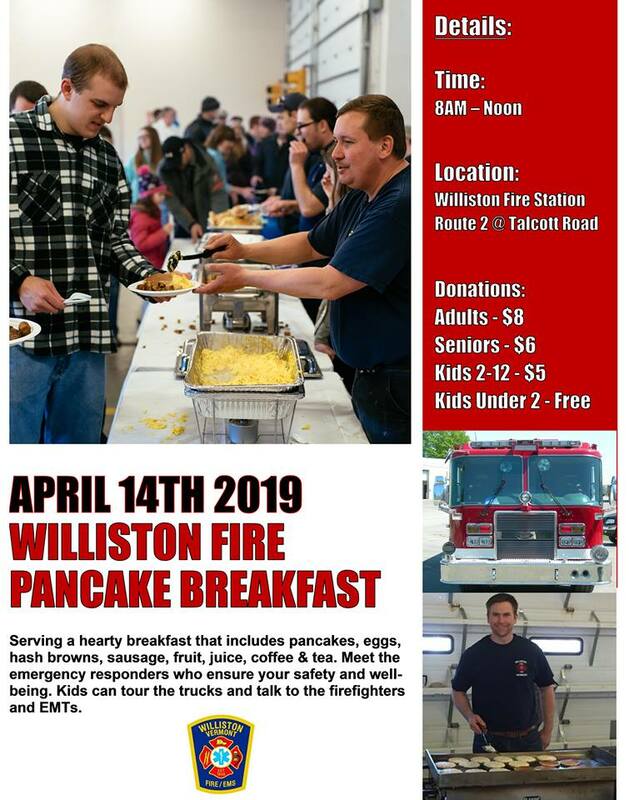 We’re seeking volunteers as Sustainable Williston (SW) provides zero-waste support to the Williston Fire Pancake Breakfast for the second year running. Volunteers are needed for 1 hour shifts beginning at 8, 9, 10, and 11am to help visitors separate compost from trash. Please contact Caylin McCamp at caylin.mccamp@gmail.com to sign-up for a shift. No prior experience required! Looking for an opportunity to do something about water quality in Allen Brook/Winooski River/Lake Champlain? Maybe you are a dog owner and care about having a clean and enjoyable place to walk your dog. 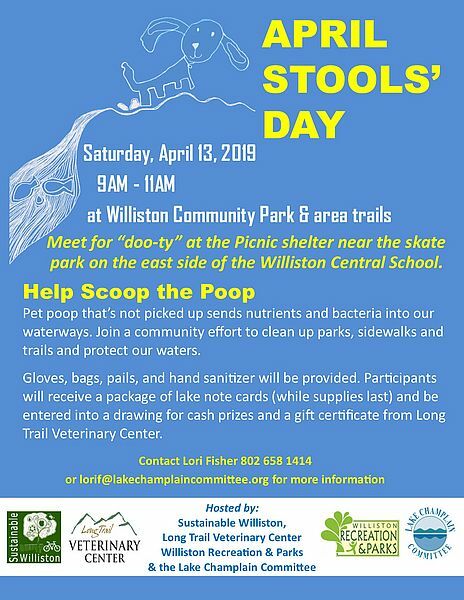 Whatever your motive, Sustainable Williston, Long Trail Veterinary Center, Williston Recreation & Parks, and the Lake Champlain Committee team up annually to facilitate a scoop the poop event. All you need to do is dress for the weather and pitch in!